In a few short years, Tidal Bay, Nova Scotia’s signature white blend has developed a following with both locals and tourists. While Tidal Bay has a distinct and recognizable style that is consistent year to year, each producer’s Tidal Bay is unique and every vintage is an expression of that year’s growing season. As Spring attempts to make itself known in the Maritimes, Tidal Bay is again top of mind for it is usually around this time of year that the most current vintage of this wine is bottled and released. This is a uniquely maritime-influenced white wine made according to a set of standards, then tasted and approved by a panel of experienced wine judges. This year, the panel saw the inclusion of technical committee members from the wine and viticultural divisions of Perennia Food and Agriculture Inc.
Nova Scotia is a cool climate viticultural region and for this reason most of the grapes planted in this province have been selected to withstand lower temperatures and a shorter growing season. The Tidal Bay blend was developed around these particularly hardy grapes: L’Acadie Blanc, Vidal Blanc, and Seyval Blanc along with other permitted grapes, some of which are vinifera, used in smaller percentages. These are the workhorse grapes of our region that don’t mind wet feet and cold weather. They are more resistant to the diseases that affect the temperamental and delicate European varieties like Chardonnay, Riesling and Sauvignon Blanc. Yet, sometimes even the toughest of grapes cannot resist what Mother Nature dishes out. When really bad weather happens at the wrong time during the vine’s lifecycle, the consequences can be devastating. Nova Scotia grape growers experienced this heartbreaking reality first hand during the early morning hours of June 4th, 2018 after a late Spring frost blanketed many vineyards in the region, damaging primary buds and vines. Some wineries lost close to all of their crop, while for others, the damage was negligible. The entire concept and integrity of Tidal Bay depends on the wine being a 100% Nova Scotian grown and produced and this remains the case for the 2018 vintage. Nova Scotia growers had to work extra hard to nurture their vines in order to produce good and viable grapes for their Tidal Bay blends this season. Simon Rafuse, winemaker at Blomidon Estate winery, said that they thankfully avoided major damage to the varieties that make up their Tidal Bay (L’Acadie, Seyval, NY Muscat), but were not so lucky with some of their other varietals. He noted that the frost really wrecked havoc on some of their earlier budding reds. Despite this, he feels they made out ok overall considering the loss others experienced. Blomidon’s estate vineyards benefit from the moderating effects of the Minas Basin, as their vines literally have a waterfront view, and any body of water can be a saving grace in a marginal climate such as Nova Scotia’s. Luckily, the 2018 growing season is not a write off! Nova Scotians are very resourceful, resilient and creative when faced with challenges. Some measures were taken with this vintage to relax some out of province content rules, which was necessary for the majority of wineries. 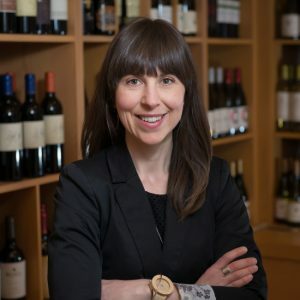 Good wines were still made in 2018 and Nova Scotia wine producers continue to insist on honesty and transparency in the labelling of these wines. There are essentially three tiers of labelling for the 2018/2019 growing season that you may come across. 100% Nova Scotia. The grapes and the resulting wine were grown and made here in Nova Scotia. Product of Nova Scotia. This maintains the current ratio of 85% Nova Scotia grapes with the possibility of 15% outside product. The 15% “other” does not need to be stated. It is important to note that this is a very common ratio in other wine growing regions, too. Product of Canada. This will identify wines that contain a majority of out of province juice. The blend could be 99% outside grapes, juice or wine and contain at least 1% NS component. When this occurs, the front label cannot mention Nova Scotia, though the back label can be more detailed and state something like, “a blend of Ontario Riesling and Nova Scotia Riesling” . In this spirit, marketing-savvy winery owner Pete Luckett just released the aptly named “Sometimes you have to make the call” referring to their call for help to Ontario grape growers for juice in order to maintain inventory and satisfy the growing demand for his wines. Other Nova Scotia wineries will be releasing wines labeled as 100% Nova Scotia, Product of Nova Scotia and Product of Canada. I am looking forward to tasting the fruits of this past vintage as these wines begin to appear in stores, restaurants and cellar doors across the province over the next few months. Interested in learning more about Tidal Bay or tasting all of this season’s wines? Stop by the Bishop’s Cellar Blind Tasting Booth at the upcoming 12 Tides Event hosted by the Winery Association of Nova Scotia. Get your tickets here.